A witness from Hutto in Williamson County, Texas, has reported sighting an orb UFO flying close to the ground and emitting a green light. According to the witness, the UFO flew close to the ground and moved to and fro over a grassy area as if it was scanning the ground searching for something According to the testimony filed as Case 72672 in the archives of the Mutual UFO Network (MUFON), the encounter with a mysterious orb UFO occurred at about 8:14 a.m. local time on November 22, 2015, as the witness was driving into Hutto. The witness told MUFON that as she drove into Hutto she “noticed a weird green light close to the open grass area and pulled to the side.” She watched as an orb UFO hovered over an open grass area, moving to and fro close to the ground as if scanning the ground below in search for something. The mysterious silver-colored orb UFO had green lights and moved from side-to-side in the manner of a dog sniffing the ground in search for something, according to the witness. Then, suddenly, it turned off its green lights and zoomed off. “ It went side-to-side and then just zoomed off. This thing was very close to landing. It was just searching for something in the grass,” she said. “I have never in my life seen something like this. It was silver, but the lights were green. Not too far from the grass.” The witness was scared by the sighting, saying she had never seen anything like the orb UFO in her life. It moved over the ground for about 30 seconds after the witnessed pulled over to observe, and just before it zoomed off into the sky she had feared it was approaching her car. “I was so scared. 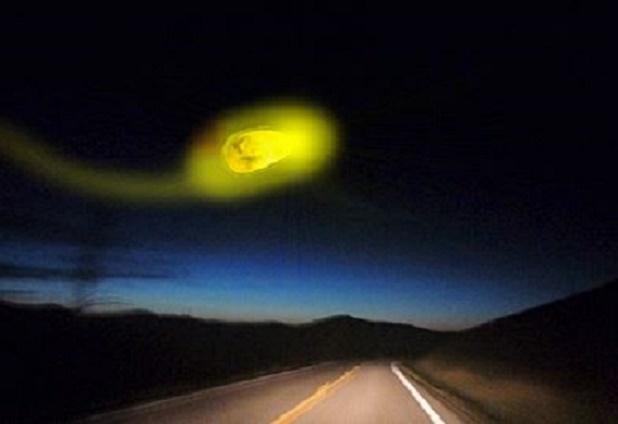 I thought it would come close to my car,” she told MUFON. “This is something I will never forget. It kept going side-to-side looking and this went on for 20 or 30 seconds and then it just turned off the light and zoomed away straight forward as fast as it could.” MUFON reports that representatives of the organization in Texas are investigating the baffling case. NOTE: The above image is a rendering. This entry was posted in ABDUCTION, best ufo photos, incredible ufo photos, MISSING TIME, top ufo news, UFO, UFO ARTICLES, ufo news, ufo photos and tagged 11-22-15 HUTTO TEXAS UFO ORB, 2015 HUTTO UFO ORB, ABDUCTION, ALIEN CRAFT, animal abduction, army ufo, best ufo images, best ufo photos, best ufo pictures, best web site world ufo photos, biggest ufo web site, boomerang craft, chief investigator, CIGAR, civilian panic, commercial pilot ufo, COSMOMAUTS ALIEN ENCOUNTER, crashed disc, CYLINDER, cylindrical craft, diamond ufo, DISC, disclosure, discoveries on mars, discoveries on moon, FLYING SAUCER, government black ops, HUTTO TEXAS UFO ORB, I.S.S. UFO, incredible ufo photos, international space station and ufo alien craft, KEN PFEIFER, ken Pfeifer discoveries, Ken Pfeifer State Director for MUFON in Rhode Island, Ken Pfeifer State Director for MUFON in Vermont, largest ufo photo website, largest ufo web site, largest ufo web site in the world, LIGHT, LIGHTS, marine ufo, MARS, mars discoveries, mars photos, MEN IN BLACK, MISSING TIME, MOON, moon discoveries, moon photos, MUFON, national press club ufo, navy ufo, no disclosure, NOBEMBER 22, ORB, ORBS, pfeifer, pyramid ufo, radio ken Pfeifer, rectangle ufo, RUSSIAN UFO, Saturn discoveries, saucer, secret society, SPACE ENCOUNTER, State Director Ken Pfeifer for MUFON in New Jersey, STRANGE, sun photos, swamp gas, top ufo news, TRIANGLE, ufo, UFO ARTICLES, ufo crash, ufo news, ufo photos | Tagged air force ufo, unidentified submerged object, unidentified submerged objects, uso, world largest ufo web site, world ufo photos and news, world ufo photos is the largest UFO photo website in the world, worlds largest UFO website is world ufo photos.org by KEN PFEIFER. Bookmark the permalink.